"The Avengers" on Director Joss Whedon's "Genius"
At long last: Joss Whedon’s ready for his close-up. The writer-director has long been one of the reigning cult heroes of the geek chic set. Though his writing career began mainstream enough (with sitcoms like “Roseanne” and films like the first “Toy Story”), his street cred weighed heavier in the genre corner of Hollywood than the larger pop culture landscape after creating beloved – but not necessarily universally embraced – properties like “Buffy the Vampire Slayer,” “Angel,” “Firefly” and “Dollhouse” (not to mention hailed runs on the "Astonishing X-Men" and "Buffy" comic books), even as a few like-minded contemporaries like J.J. Abrams and Christopher Nolan have broken barriers to bigger things. But now, as Whedon deftly and delightfully assembles Marvel Comics’ superheroic icons – many of whom have already enjoyed major mainstream success on screen – for “The Avengers,” it may be the director’s shining moment, the final step for the geek inheriting the earth – or at least Hollywood. PopcornBiz was on hand as Whedon delved into the choices that fueled the fun and the fighting in what promises to be his breakthrough success. Black Widow (Scarlett Johansson) is surrounded by goons, but primed to deliver the best so-what-if-I'm-tied-to-a-chair beatdowns since Statham in "Killer Elite." 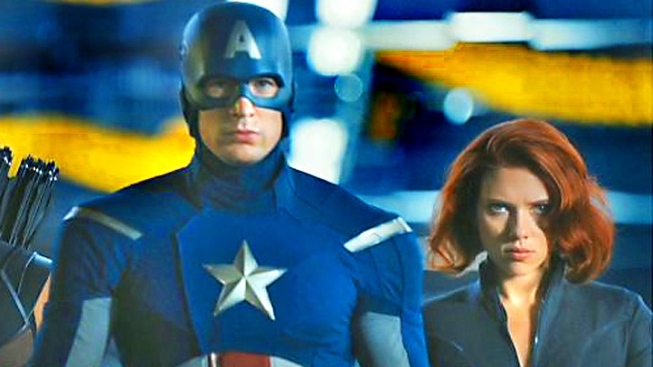 "The Avengers" assemble May 4.